The inherent vibrant energies in different colors swaying in my mind. The red color flag makes bull charge with rage. The green soothing to the eye. My memory takes me back to the primitive days. Man made colors, costlier than diamond, being sold by weight. Those days when artificially made colored stones were costlier than the real rubies mined at Mogok mines in Burma. Traders used to scrupulously mix real rubies into the artificial gemstones and cheat customers. Pictures were a luxury. There is a rare picture which made a place in my mind and soul. Rothschild was a wealthy man and he entrusted Mr. Hardy with the task of training a set of Zebras to pull his chariot. Though Mr.Hardy was a horse trainer and Zebras were wild and impossible to train. I muse at times in my mind over the hefty sum of money that was paid and Mr. Hardy successfully trained the set of Zebras in two whole years. 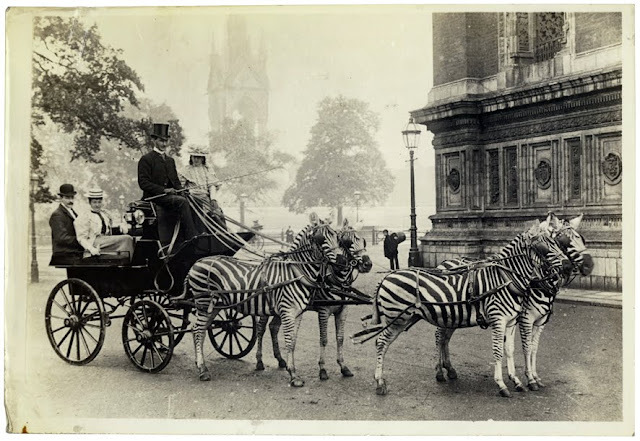 Oh My, My mind never tiers visualizing Rothschild and family, in their dream chariot, pulled by the Zebras, roaming around the streets of London. Just one glance at this rare work of art enlivens the world of colorful London streets, with dismayed watchers looking at the chariot with awe. With the latest innovative techniques being invented day by day, I am pretty much certain one day, I will be seeing this piece of art below in full vibrant dynamic color combination. If you like and wish to vote, here is the link friends.